If you know even a little about the history of abortion in the USA, you have heard the name Dr. Bernard Nathanson. 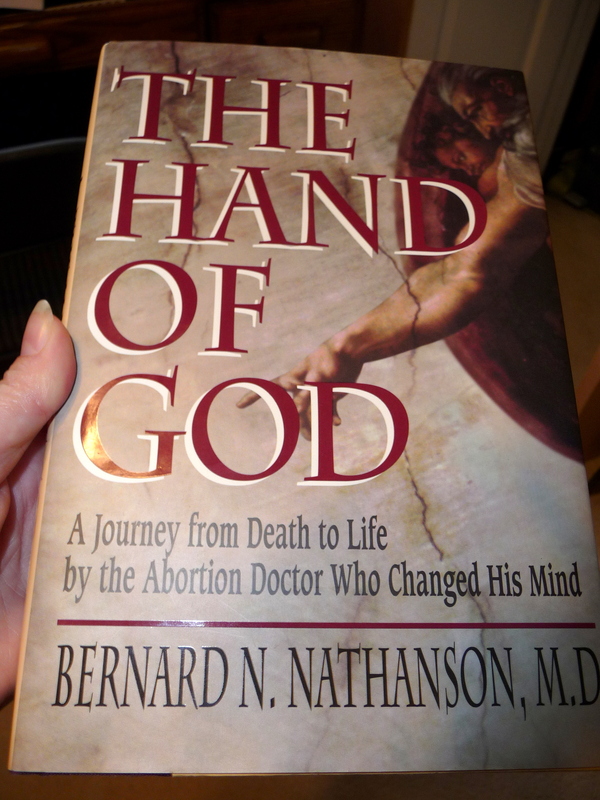 I stumbled upon his book at a local thrift store: The Hand of God, A Journey from Death to Life by the Abortion Doctor Who Changed His Mind. (Regnery Publishing, 1996). I could hardly put this book down once I began reading it! I highly recommend it to you. Amazon link here. Sometimes book reviews are hard for me to write because the book “overwhelms” me in a good type of way, and this is one of those books. It gave me so much to ponder, that I hardly know what to say except: read the book yourself! In fact, I thought about not writing a review because I did not think it would do the book justice. But I must try, because people need to read this book. It is partly autobiographical about Nathanson’s personal life and partly a history of abortion – directly related to his involvement with it. Of course, his personal life and abortion life interconnect – helping explain how he ended up where he did in life. Nathanson grew up in the Jewish culture, but would later identify as atheist – a fairly common thing among Jews. There was much tension in his family growing up, as there was ill-will between his father and his mother’s family. His dad was a difficult man whom he describes as “a deeply confused, fragile, driven man with no point to his life” (page 33). His father was an obstetrician/gynecologist, and Nathanson followed him into this career. Nathanson’s personal life was troubled, and he had several failed marriages. He expressed regret about the neglect of his son – being consumed with his career, he was rarely home. Nathanson was involved with abortion early – he was a key figure among those who began working towards the legalization of abortion in the 1960’s. Some of these individuals were literally obsessed with the legalization of abortion, and it consumed their life. He was one of the founding members of the National Association for the Repeal of Abortion Laws (later renamed the National Abortion Rights Action League). In the 1970’s Nathanson became known as “the abortion king” and presided over about 60,000 abortions. What led the abortion king to renounce abortion and become a pro-life activist? The development of ultrasound. And ultrasound alone. He was callous with the many abortions he performed, even aborting his own child – with no remorse or emotional difficulty. He offers some thoughtful analysis about this callousness and the ability to disconnect from what you are doing. It was not until he saw abortions performed as an ultrasound recorded it (a new technology at that time) – that everything changed. Him and another colleague were stunned when they first observed ultrasound as an abortion was done. The doctor who did the abortion was “so affected that he never did another abortion” and Nathanson “was shaken to the very roots of my soul by what I saw” (page 41). Nathanson emphasizes that his “conversion” from pro-abortion to pro-life was a purely empirical event. He came “to the conclusion that there was no reason for abortion at any time; this person in the womb is a living human being, and we could not continue to wage war against the most defenseless of human beings. Having looked at the ultrasound, I could no longer go on as before…To disrupt or abort a life at this point is intolerable – it is a crime. I don’t make any bones about using that word: Abortion is a crime” (page 128, 130). Remember “The Silent Scream”? One of the tapes of an abortion being recorded by ultrasound was turned into this short film. Nathanson, in detail, talks about how abortion doctors tend to be the dregs of the medical field. At one point he made sure he had competent and quality doctors at his clinic, but it could not be maintained. Are all abortion doctors incompetent? No. But he explains the various reasons that “lured the competent away from the abortion clinics, leaving the vacancies to the inexperienced and the losers” (page 121). At one point he refers to abortion doctors as “quacks and hacks” (page 123). Nathanson was not being flippant or insulting, only truthful, and thoroughly explained why abortion tends to attract incompetent doctors. In a word so prophetic it stunned me, Nathanson said that his own experience “leads me to the conclusion that the abortionist problem is inherent to abortion and likely to get worse, not better” (page 119). The “abortionist problem” refers to abortion doctors tending to be incompetent, even dangerous. Note: there are incompetents in every field of medicine, but for abortion it seems inherent. Nathanson’s prediction was accurate. Think of the recent horror of Kermit Gosnell, among others. The book also brought up the (then) new area of selling fetal body parts for supposed research – that was both fruitless and impractical. I’d never considered the total impracticality of fetal tissue, even if legitimate ways to use it were found. He states “The prospects of real benefits from fetal research or tissue therapy are sufficiently far-fetched to make one wonder about the motives of its advocates.” – Not much has changed since 1996, and the senseless horror continues. Nathanson remained an atheist, even after he became involved in the pro-life movement. But he was gradually drawn to faith in God and ultimately to Roman Catholicism. He was deeply impacted by the moral witness of the Christian believers he encountered as he became involved with the cause. I wish Nathanson had shared more about his conversion to Christianity, as he only talked about it more broadly and in tidbits. I highly recommend this book to you. It is a well written, honest memoir, with much to consider for anyone who cares even a little about the abortion issue in this country. That means you. Whether you identify as pro-life or pro-choice, there is much to ponder about the history and reality of abortion. It is also a story of redemption. Through faith in Christ, there is hope for everyone and sin can be forgiven. If you appreciated this review, please consider sharing it. Click below. I heard Dr. Nathanson speaks years ago when I was the director of a pregnancy help center. He has a very powerful story. I was struck by the toll performing abortions took on his marriages and on his health. Tragic all the damage abortion does – to babies and mothers and fathers and doctors and societies…. Thanks for your comment Julie! Feel free to share the book review link on social media – more people should read this book.